This time we talk to a young couple who stayed at Sterling’s Club Estadia, in Goa. We talk to Rina Dsouza and Abraham Philip who are based in Bangalore. Rina has done her engineering in electronics and communication, and currently works with Cognizant. Abraham finds his job in the hospitality industry extremely fulfilling and rewarding. We talk to this young couple, who got married in December and had to wait till March to go on a honeymoon. Work always comes first, says Abraham, who met us at his office. Q: How did you choose Goa for your vacation? Q: How did you pick Sterling’s Club Estadia? A: Actually our three-day stay at Club Estadia was a wedding gift from a well-wisher of ours. And we thank him for the gesture, because we really had a good time at the resort. Club Estadia has a design imprint that mirrors Spanish architecture, with the benefits of contemporary interiors and facilities. Adding to the visual appeal is a setting with easy access to beaches such as Baga, Calangute, Vagator and Candolim – which are just a few minutes away if you have some kind of transport. The room that we stayed in was comfortable and spacious. It was a room with a view, which was one of the many things we liked about it. Q: What are the facilities at this resort that you want to talk about? A: Club Estadia offers you a wide choice of rooms and suites. It’s ideal for leisure travellers, with facilities that include an outdoor pool, kids’ pool, sauna and jacuzzi. The resort has a Holiday Activities Centre that was quite popular, offering indoor and outdoor recreational activities. During our stay, the team here also organized fun events around a bonfire, with party games and music. Q: What did you like about the food at the resort? A: I particularly liked the multi-cuisine restaurant that serves up Oriental, Continental, Indian, and yes … authentic Goan food. We found the interiors here lively, with colorful flags and paintings on the walls. The dinner buffet organized every day by the poolside was a treat, and the breakfast fare was also quite nice, though they could add a little more variety – a small observation made by me. Room service was crisp and efficient, which can be nice if you don’t want to venture out. Q: What are your impressions about service at the resort? The Club Estadia experience starts with their welcome drink, served with a lot of courtesy. The staff at the resort takes special care to provide individual attention. And this is something I can actually say, with a great deal of satisfaction. They know your names, and quickly understand what your preferences are – and this kind of personal attention can make a big difference. 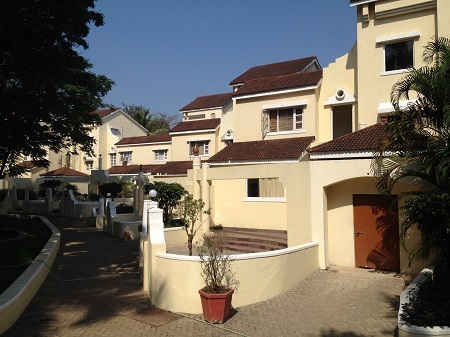 Sterling Club Estadia is in Alto Porvorim, near some of the popular tourist spots like Sinquerim Beach and Jama Masjid - which are within driving distance. The Kerkar Art Gallery, near Calangute Beach, is an interesting stop-over, and Fort Aguada is a must-see on your check list. The Basilica of Bom Jesus, a UNESCO world heritage site is also within easy driving distance.